This has been such a popular series (thank you to everyone who has emailed me about how much they love the pictures). 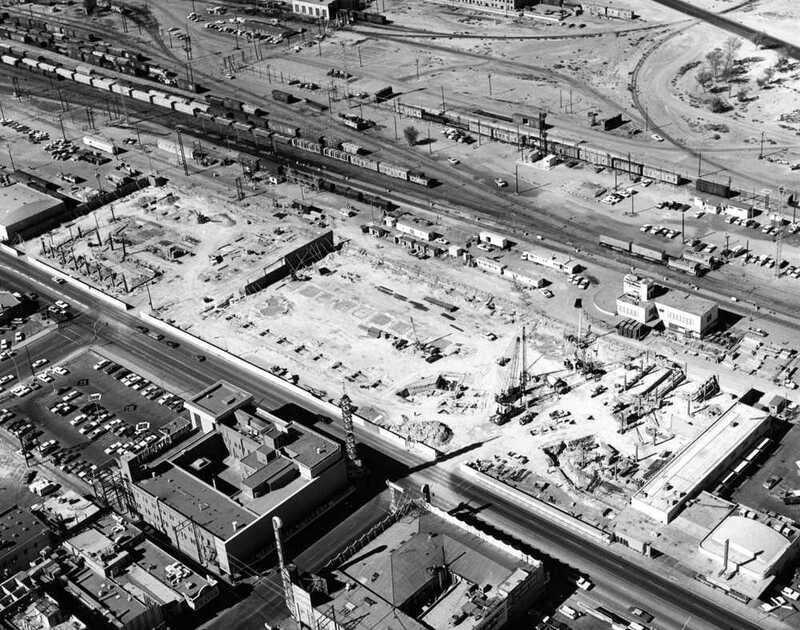 The Union Plaza site with Von Tobel Lumber in the foreground. 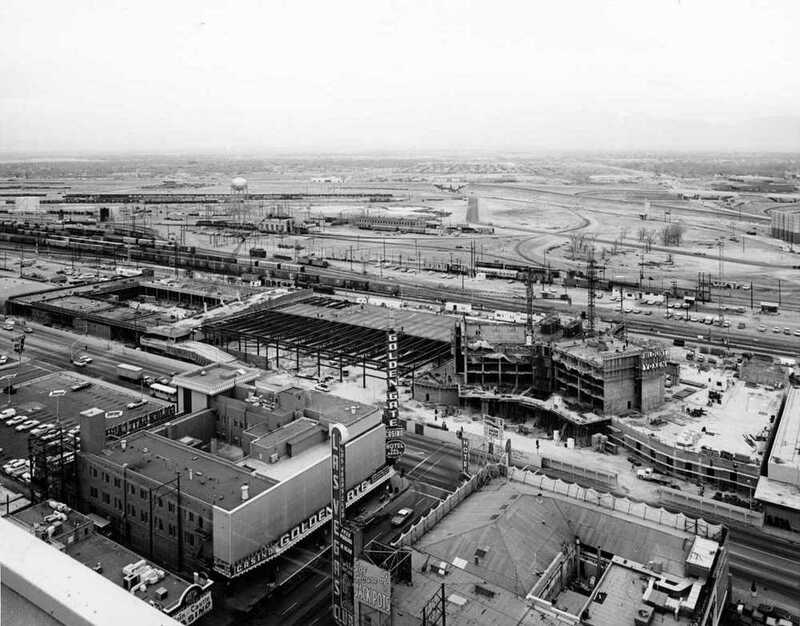 Looking north, you can see the Train Depot and tracks and Cashman Auto Dealership in the background. That is Main Street with cars on it. What used to be Union Park and all the trees are gone, the Train Depot still sits in the back of the property. The Golden Gate and the Las Vegas Club sit in the foreground. 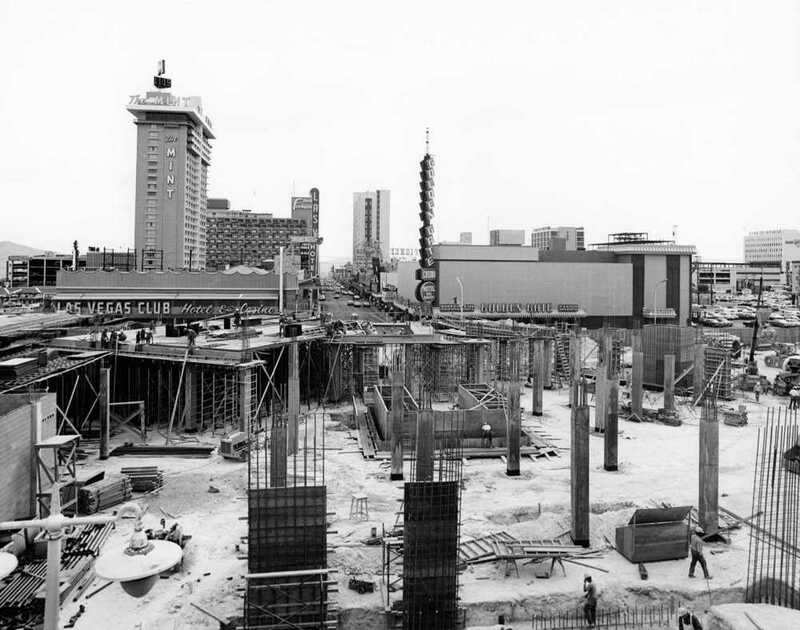 The Union Plaza begins to be built. 1969, the Train Depot has been torn down. Three different depots have sat on this property, the first one built in 1905. But, in 1969, that was all history. Train service to Las Vegas continued until the late 1980s via Amtrack's Desert Wind. 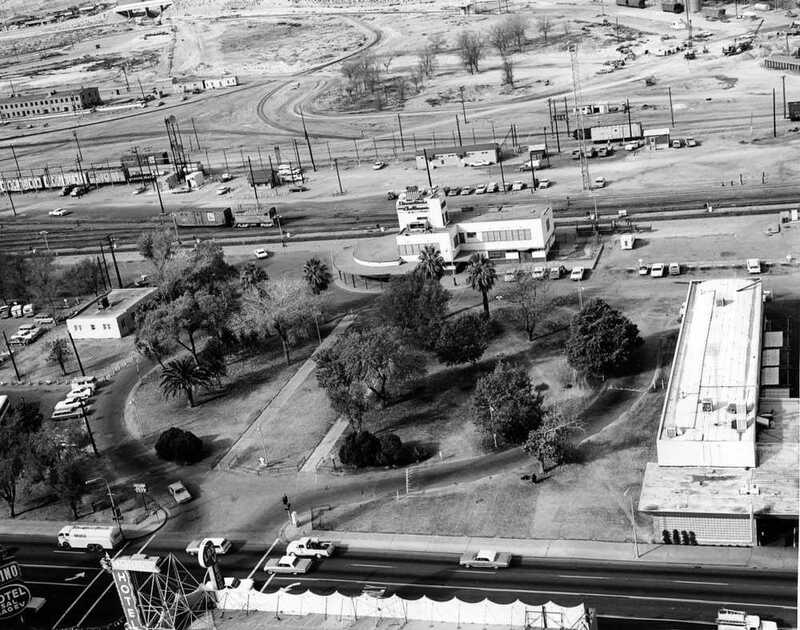 The far south end of the Union Plaza handled trains, Greyhound buses and in the 1970s was the main hub for local buses as well. I spent many a Saturday afternoon/evening waiting for the bus that would take to me to the Huntridge Theater or the Charleston Plaza Mall's Fox Theater to see a double bill. After a day at the movies, I had to wait at the Plaza for the bus to take me back to Charleston Heights. "Diamonds Are Forever" starring Sean Connery as Bond, James Bond was shot on location while the Union Plaza was under construction. You can't see much since most of the action on Fremont Street takes place at night, but the film is a wonderful time capsule of 1970's Las Vegas with a number of locales and signs that are no longer there. 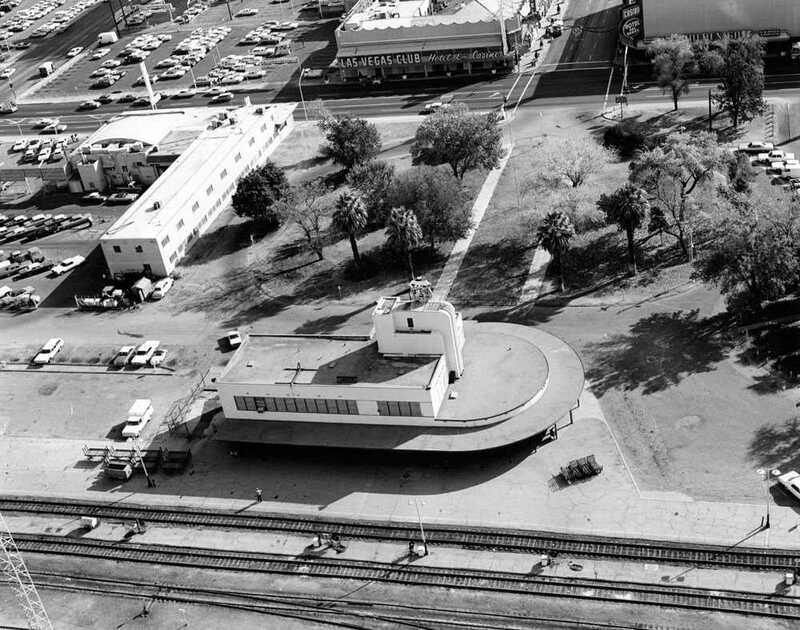 We've had a couple of emails from people asking about the Union Plaza and wanting to see more pictures about the Train Depot, Union Park and what was there before the Union Plaza was built. Thanks to our good friend, Dennis McBride, at the Nevada State Museum, Las Vegas we can do just that. This is an aerial shot of Union Park with the Train Depot sitting in the background with the train tracks behind the Depot. 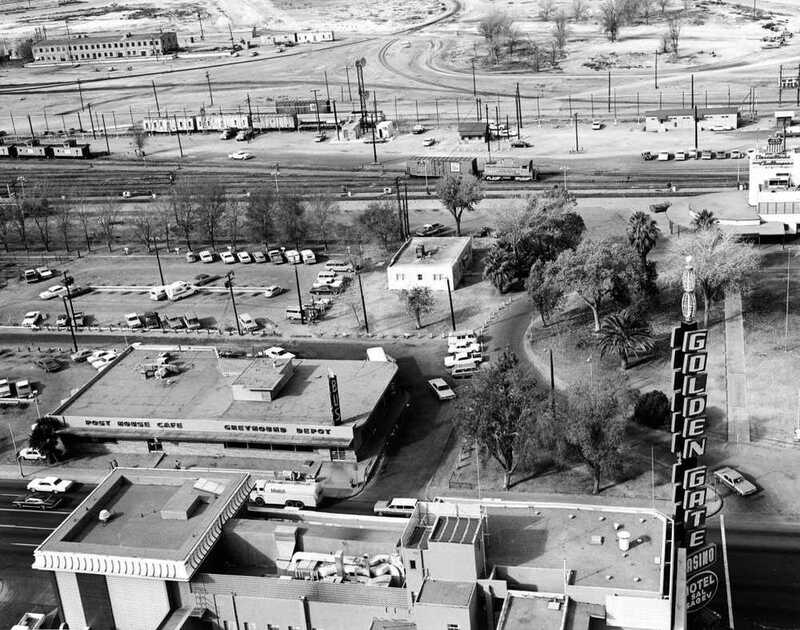 In the foreground, you get a glimpse of the Las Vegas Club neon sign and roof line and a small glimpse of the Golden Gate neon sign on the left. This is the Train Depot looking east. Union Park is front with the Las Vegas Club across the street. To the left of the Depot is part of the Cashman Dealership. This is looking just south of Union Park and the Train Depot. In the foreground is the Golden Gate. Across Main Street is the Greyhound Bus Terminal and Von Tobel Lumber. 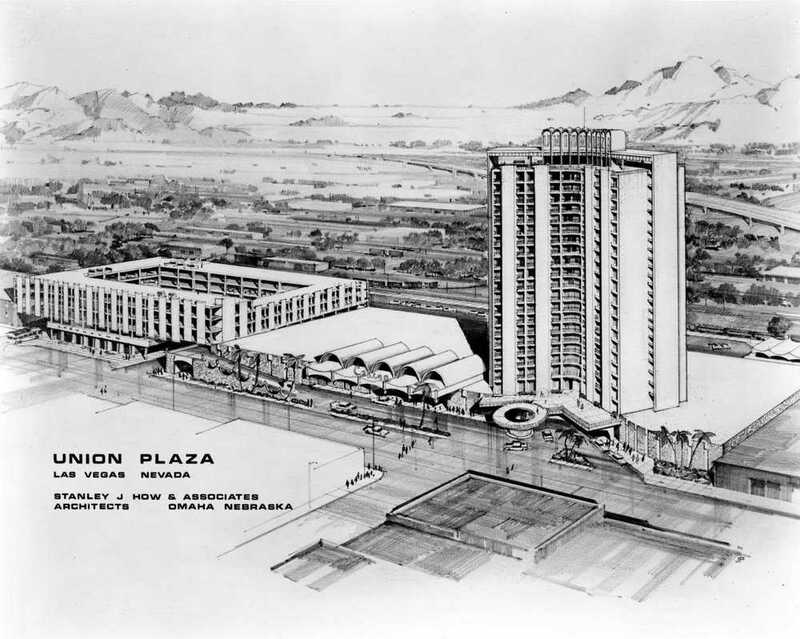 Rendering of the Union Plaza Hotel. Though the rendering credits Stanley J. How and Associates in Omaha, Nebraska, the local firm of Walter Zick and Harris Sharp were involved as well. Construction begins on the Union Plaza. The Las Vegas Club and the Golden Gate are in the foreground. The Train Depot has yet to be torn down.